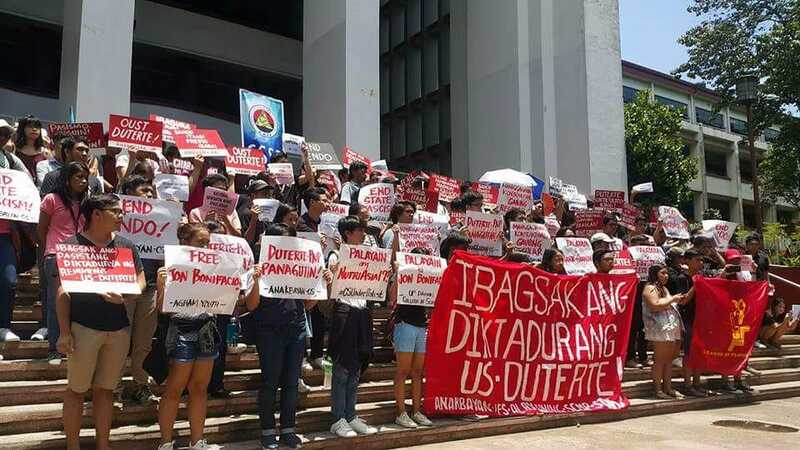 MANILA – The University of the Philippines (UP) community denounced the arrest of 19 NutriAsia workers, supporters and journalists covering the incident and demanded the immediate release of those detained. Meycauayan police and NutriAsia security guards started dispersing the NutriAsia workers and their supporters yesterday, July 30, during an ecumenical mass by pelting them with rocks and hitting them with rattan sticks. Nineteen were then arrested, of whom five are journalists including UP students Psalty Caluza and Jon Bonifacio. Caluza, a fourth year journalism student and AlterMidya intern, and Bonifacio, member of Agham Youth and graphics artist of Scientia, the UP College of Science (CS) student publication, were covering the event when they were arrested. Dr. Diosa Labiste of UP Journalism Department questioned the police’s move to arrest journalists who were covering the event. Also arrested were Altermidya members Avon Ang, Eric Tandoc and Hiyas Saturay. Labiste said that the arrest of five journalists who were on duty wearing their press cards and badges imply that journalism is treated as illegal by the police. According to Labiste, journalism is essentially an act of bringing out the truth, which is what the journalists who went to cover the strike in NutriAsia did. “This is in the context of media harassment under Duterte […] they don’t like journalists who are critical because they don’t want to get exposed,” Labiste said. Officials from UP College of Science also called for the release of their student Bonifacio and other detainees. UP College of Science Associate Dean for Student, Alumni and Public Affairs Dr. Eizadora Yu described Bonifacio as an “ideal student” who is both an Oblation scholar and candidate for graduation with honors. For his part, UP CS Associate Dean and Agham chairperson Dr. Gani Tapang lauded Bonifacio’s decision to report on the struggle of marginalized sectors. “It wasn’t hard for Jon and youth like him to see the violence and inequality that workers and Filipino masses experience, which is why it’s also easy for them to expose the truth,” Tapang said. Meanwhile, Congress of Teachers/Educators for Nationalism and Democracy –UP (CONTEND – UP) also expressed their support for the arrested workers, supporters, and journalists. In a statement, CONTEND – UP emphasized how it is an educator’s duty to stand up for social justice and therefore support workers who are fighting for their legitimate rights. “We do not teach our students to become docile workers in the future who will simply allow their basic rights to be violated,” CONTEND – UP said. UP students led an indignation rally at the Palma Hall during at 12 noon.